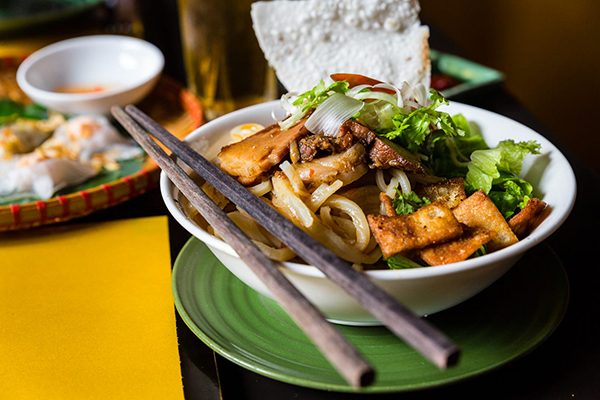 If you're traveling to Hoian, here are the seven signature dishes you must try while you are in the ancient Vietnamese town. 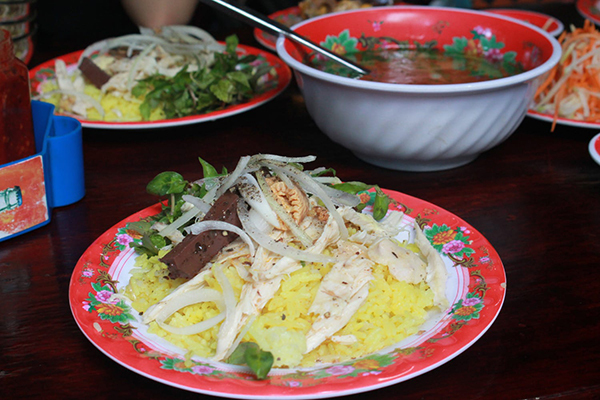 Hoi An chicken rice attracts diners with its eye-catching colors. You can order a plate with either chicken strips or chopped chicken for around VND40,000 ($1.77). You can also order chicken, rice, and soup when you come in a group. The most famous restaurants are Madam Buoi's on Phan Chu Trinh Street and Huong's on Le Loi Street. A mouth-watering bowl of Cao Lau is full of poached noodles, bean sprouts, and it cannot be completed without herbs from nearby famous Tra Que village. Above the top of the bowl is thin slices of barbecue pork or char siu and crispy fried pig skin. You can find Cao Lau almost everywhere in Hoi An, especially Thanh Cao Lau on Thai Phien Street, Madam Be Cao Lau on Tran Phu street. A delicious Cao Lau bowl will cost you only over $1. Photo credit: Ma Lum.A mouth-watering bowl of Cao Lau is full of poached noodles, bean sprouts, and herbs from the famous Tra Que Village. On top of the dish sits thin slices of barbecue pork and crispy fried pig skin. You can find Cao Lau almost everywhere in Hoi An, but try Thanh Cao Lau on Thai Phien Street or Madam Be Cao Lau on Tran Phu Street. A delicious bowl of Cao Lau will cost you around $1. 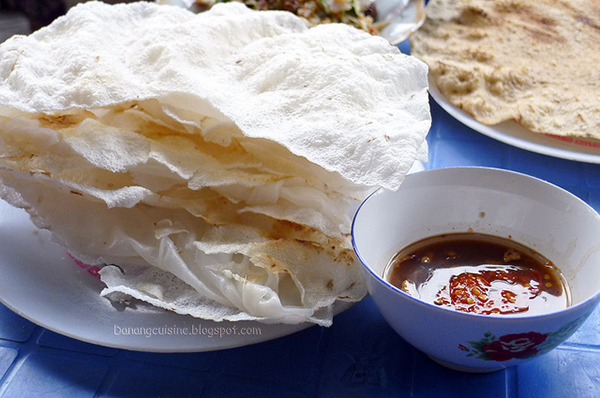 This is the dish that almost everyone has tried when coming to Hoi An. Hoi An bread is like no others with always-hot-baguettes, delicious meat, and Pâté, homemade sauces, hot peppers, herbs and pickled carrots. Madam Phuong bread and Madam Khanh bread are the most famous local restaurant in Hoi An, which is talked most by foreign media. A normal bread will cost you some VND 20,000 (less than $1) while the special one is a bit more expensive at VND 25,000. This is the dish that almost everyone has tried in Hoi An. 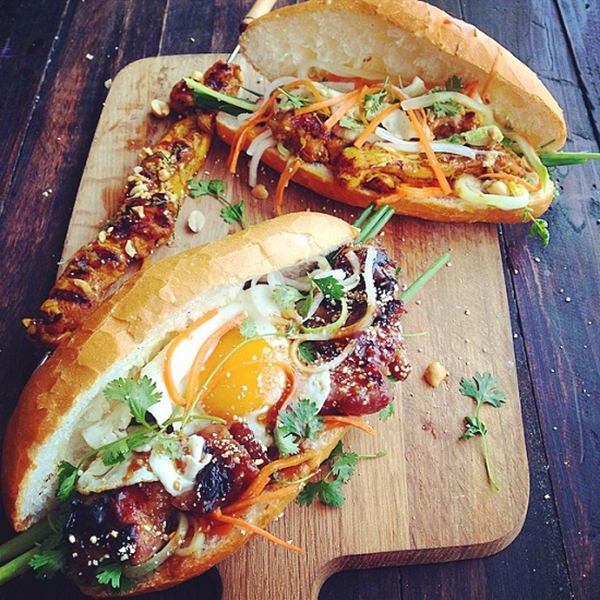 Hoi An bread is like no other, with the hot baguettes filled with delicious meat, pâté, homemade sauces, hot peppers, herbs and pickled carrots. Madam Phuong and Madam Khanh are the most famous local restaurants in Hoi An, and are often mentioned in foreign media. A normal baguette will cost you VND20,000 (less than $1), but splash out an extra VND5,000 for a special. 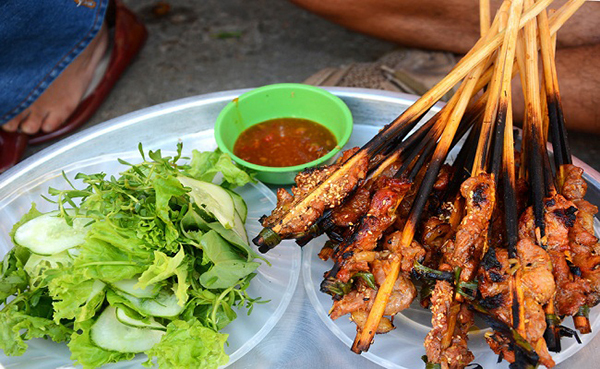 From Tran Phu Street to the corners along Le Loi, Tran Hung Dao and Bach Dang, visitors can easily find fragrant barbecue skewers. Meat grilled in a charcoal oven is wrapped inside a thin layer of rice paper with herbs and sour slices of star fruit. The treat is best served with a special sauce and costs just VND5,000 (around 22 U.S. cents) per skewer. A serving of girdle cake includes steamed thin rice pancake sandwiched between two grilled ones. To enjoy the dish, you should use your hands to slightly flap them down so that they are crumbled. Later, you roll the dish and dip it into fish sauce paste, which is a mixture of fish sauce, sugar, caramelized onions, chopped pineapple, garlic, and greenhorn pepper. The most famous girdle cake is served at Madam Gia restaurant in Cam Nam Ward. A serving of girdle cake includes thin steamed rice pancakes sandwiched between two crispy cousins. To enjoy the dish, you should roll the cake and dip it into a fish sauce paste, which is a mixture of fish sauce, sugar, caramelized onions, chopped pineapple, garlic and greenhorn pepper. The most famous girdle cake is served at Madam Gia's Restaurant in Cam Nam Ward. Hoi An bloating fern-shaped cake is usually placed in tiny bowls, with the rice flour, shrimp paste, and fried pig skin. Diners will pour fish sauce with chili and enjoy the dish. Most popular place to sell the dish is small restaurants in Cam Chau, Cam Nam wards or inside Hoi An market. Each bowl costs only VND 3,000 (13 U.S. cents). 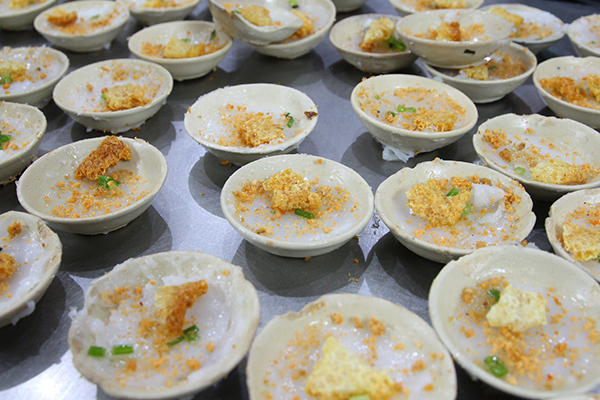 Hoi An's water fern cake is usually served in tiny bowls with the rice flour, shrimp paste, and fried pig skin. Diners add the fish sauce with chili to enjoy the dish. The most popular places to find the dish are in Cam Chau and Cam Nam wards, or inside Hoi An's market. Each bowl costs only VND3,000 (13 U.S. cents). Walking along Hoai River in the evening, you will see many street vendors selling Tofu pudding surrounded by many customers. A bowl of Tofu pudding with sweet and spicy ginger soup, white jelly, coconut milk gives you a tender feeling of coolness and sweetness. Each bowl costs around VND 10,000 (less than half $1). Walking along the Hoai River in the evening, you will see many street vendors selling tofu puddings surrounded by many customers. 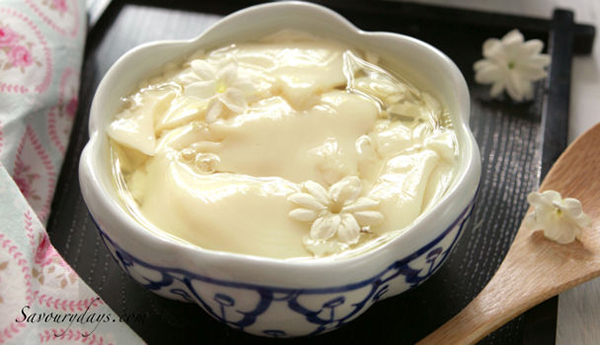 A bowl of tofu pudding with a sweet and spicy ginger soup, white jelly and coconut milk offers a cool, sweet sensation. Each bowl costs around VND10,000 (less than half a $1).